A photo of a 2-year-old girl crying near the US-Mexico border — a child who became an iconic face of President Donald Trump’s “zero tolerance” immigration policy last year — has won the World Press Photo of the Year award. The Netherlands-based World Press Photo organization announced the award Thursday evening at a ceremony in Amsterdam. “I think this image touched many people’s hearts, as it did mine, because it humanizes a larger story,” the organization quoted Moore as saying. READ Optical Illusion Goes Viral, so do YOU see two legs or one? Before the photo was taken, the Honduran girl and her mother had rafted with others across the Rio Grande and were stopped in Texas by US Border Patrol agents. Agents were searching people before they were put into vans to be driven to a processing center. Moore took the award-winning picture after the toddler’s mother set her down so that the mother could be searched. The annual photo award, decided by a jury of photojournalists and photographers, carries a prize of 10,000 euros (nearly $11,300). Photos that Moore took of the girl that night were widely published amid a fierce public debate last year about the Trump administration’s immigration policies, which effectively resulted in children being separated from adults after they crossed the US border from Mexico. Children could not follow their adult family members or guardians into custody, so US guidelines mandated that those children be separated — often from their parents. 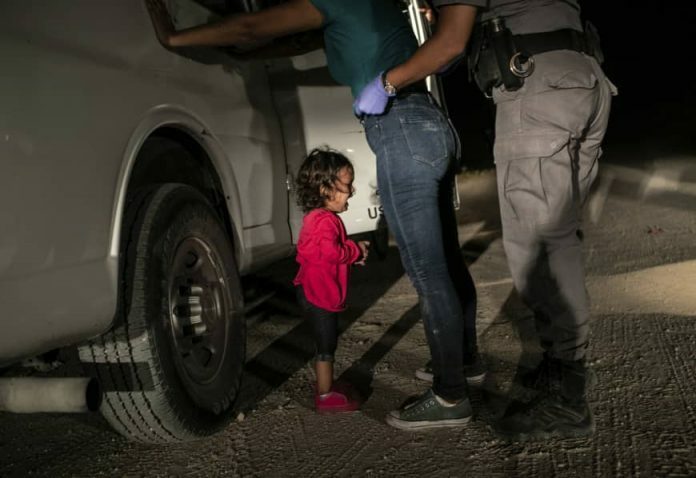 After the picture was published, US Customs and Border Protection said the girl and her mother had not been separated. Later that month, Trump signed an executive order reversing the policy to separate children from adults.